Combine all marinade ingredients in a food processor and puree until smooth and creamy. Place filets in a shallow baking dish and pour the marinade over filets. Let filets marinate on the counter for 1 hour. Brush grill grates with canola oil then place filets on the hot grill. Grill from about 4- 6 minutes per side (depending on the thickness). And remember, it's better to undercook than overcook. Peel mangoes using a vegetable peeler not a knife. Slice mango off the seed (large slices in order to grill). Place mango slices on hot oiled grill long enough to get grill marks on both sides. Once mangoes cool down, cut into ¾ inch strips. 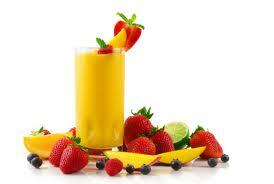 In a blender, pour in the orange juice,strawberries and juiced lime, blend until it’s a smooth paste. Toss grilled mangoes in sauce and serve. Note: This same strawberry coulis can be served on/with any fruit, chicken, fish, beef or lamb. And the berries can be any berry. Note: Once you place salmon on the hot grill, leave it alone, let it cook long enough for the grill to release it naturally 3 – 4 minutes. If using a charcoal grill wait until ambers are ash colored before placing on the fillets. Don't Like it! Just Grill It! Do you love grilling or do you just love grilled food? Well you've tasted my grilled chicken. Nope but it's dry as a bone. For the world of me I can't figure out how you mess up a steak? All you have to do is follow my recipe. The point is when cooked properly most foods taste incredible just tossed on a grill. Even "nasty" veggies that I could never get you to eat are delicious grilled. Angelique: Yep even the "Horribles". Asparagus! Artichoke! Eggplant! So let's fire up the grill and enjoy some of those "Horribles". Angelique: While you're doing that I'll turn to our page Grilling 101 and learn how to light the grill. Wash and trim off bottom of asparagus. Combine olive oil, orange and lemon juice, balsamic vinegar, salt and pepper. Toss asparagus with dressing and let it marinade on the counter 1 hour. Place asparagus on the grill and grill 3 - 5 minutes, turn and grill another 3 minutes. Toss lemon or orange slices on grill and grill 1 minute turn and grill another 30 seconds. 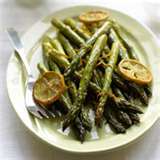 Top grilled asparagus with the grilled citrus slices and serve. From Blog: Don't Like it! Just Grill It! Mix the garlic, onions, olive oil, balsamic vinegar, cilantro, salt, chili peppers and granulated garlic together in a large bowl. Place the steamed artichokes in the mixture and marinate for 20 to 30 minutes. Combine white wine vinegar, garlic, salt and soy milk in a food processor. With the motor running, slowly drizzle in olive oil to make an emulsion. Add the chipotle peppers and adobo sauce, to taste. Add fresh cilantro and pulse to combine. 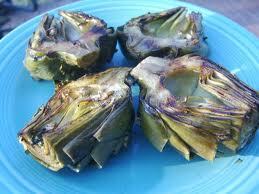 Remove the artichokes from the marinade and place on char-broiler or barbecue fire with the leaves of the artichoke up. Cook for 4 to 6 minutes depending on fire temperature. Remove from fire and garnish with herb aioli. Place eggplant in a large shallow baking dish. Mix together all other ingredients in a small bowl. 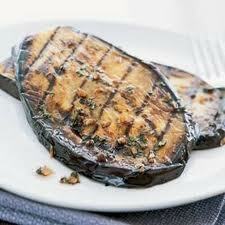 Pour the marinade over the eggplant and let marinate at room temperature for 1 hour. Grill on each side for 3 minutes, basting occasionally with the remaining marinade. The more we learn, the clearer it is that longevity isn't just about our genetic heritage. Instead we can control many of the factors that will influence the quality and quantity of our years with all those small, daily decisions we make about nutrition, fitness, sleep and other health behaviors. So when we saw the recent study linking vitamin D and calcium supplements to a longer lifespan, it got us thinking. What other nutrients or foods could help improve lifespan? Read on for some tasty items that may just add years to your life. Whole grains offer a variety of antioxidants and vitamins, and are packed with fiber, known to help protect against high cholesterol and regulate blood sugar levels, which can safeguard against diabetes. And one type of whole grain in particular --OATS -- has a unique antioxidant called avenanthramides that can offer additional protection against cholesterol. Not only are berries good for extending life -- they improve the quality of later years. Berries are chock full of antioxidants that help protect against free radical damage, but as Whole Living reported, one antioxidant in particular -- anthocyanins -- is particularly useful for brain function, balance and muscle retention. Dark chocolate is full of inflammation-reducing flavonoids, a compound that also has antioxidant properties and helps prevent blood clots. But reducing inflammation is its real longevity trick, as research shows that molecular inflammation may be responsible for much aging and cell death. Tomatoes are a great source of lycopene, the fat-soluble nutrient that helps to protect against some types of cancer, like prostate, lung and stomach cancers. Beets are rich in betaine, a compound associated with lower markers of inflammation, according to the latest research in the American Journal of Clinical Nutrition. 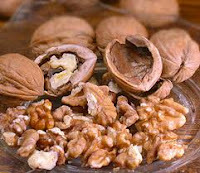 Walnuts are a great source of alpha linolenic acid (ALA), which is a type of omega-3 fatty acid associated with reduced inflammation. Note: Traditionally this recipes calls for honey but we are going to use an orange as the sweetener instead. Place chicken breasts in a shallow baking pan, or zip lock bag. In a blender puree the marinade ingredients, or in a small bowl, whisk together the juice, cilantro, garlic, olive oil, salt, onion powder and chili peppers. Pour over chicken and turn pieces to coat evenly, cover and chill at least 1 hour or overnight. Preheat a gas grill to a medium heat or start coals in a charcoal grill and let them burn until there is a white coating of ash on all the coals. 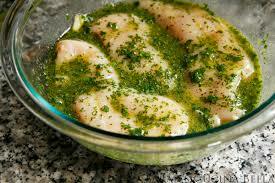 Remove chicken from marinade and reserve marinade for basting. 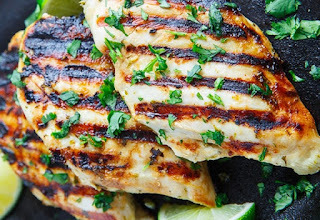 Place chicken on the grate in the grill. Cover with the grill lid and check in 10 minutes. Turn chicken over and grill another 10 minutes. Move chicken to the sides of the grate, away from direct heat. Brush with marinade if desired. 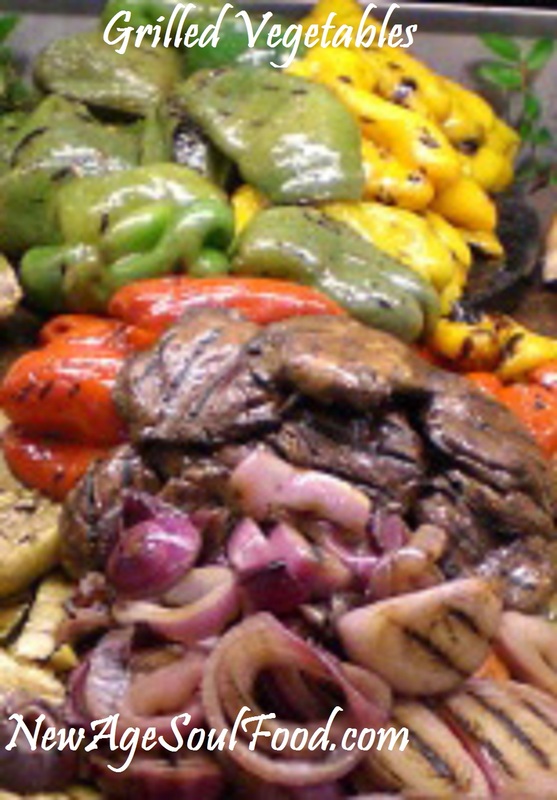 Cook until the internal temperature reaches 165 degrees and remove from the grill. If you’re not using a meat thermometer, cook chicken 35 – 45 minutes. 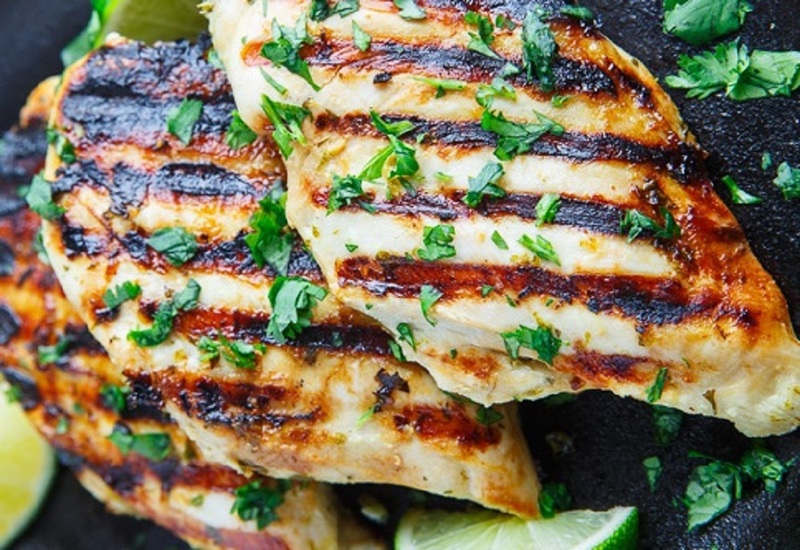 Allow grilled chicken to rest on a platter for 10 minutes before serving. This will help keep the chicken juicy and not let all the juices run out when the chicken is cut into. Wash/scrub potatoes and cut them into equal size. Cover with cold water then add bay leaf and garlic cloves, bring to a boil. Cook for 15 minutes or until potatoes are fork tender. Drain potatoes and reserve 1 cup of the cooking liquid. Place the potatoes, mustard powder, sea salt, vegan mayonnaise in a mixing bowl with a paddle. Mix just long enough for potatoes to reach a creamy consistency. Add cooking liquid ¼ cup at a time if needed. If you process too long potatoes will become sticky and gooey rather than light and fluffy. 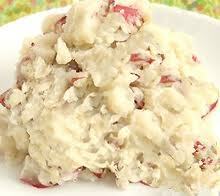 You can also use a potato masher to cream the potatoes. Just be careful not to over mix the potatoes, you want them to be light and fluffy. 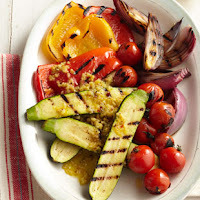 Note: You can choose any vegetables that take well to grilling, such as peppers, eggplant, tomatoes, carrots, squash, onions, potatoes, corn on the cob, artichokes, mushrooms and asparagus are just to name a few. Combine marinate ingredients in a blender or whisk ingredients in a bowl. Marinate vegetables for 15 minutes before grilling. Prepare a medium-hot fire in the charcoal or gas grill. 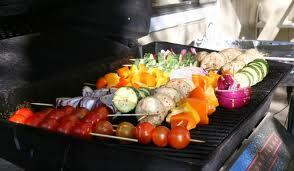 Put the vegetables directly on the grill grid, on skewers or in a vegetable basket. 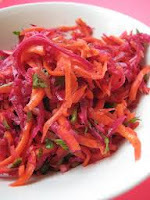 Turn the vegetables often, brushing on more marinade as needed. Remove the vegetables when they can be easily pierced with a fork. 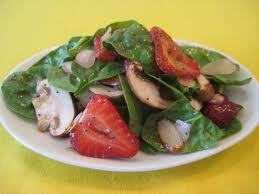 In a salad bowl, toss the spinach, strawberries, onions and mushrooms. 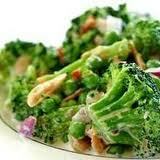 In a blender, combine the dressing ingredients; cover and process until blended. Serve with salad. Refrigerate any leftover dressing. In a blender puree the marinade ingredients, OR in a small bowl, whisk together the juice, cilantro, garlic, olive oil, salt, onion powder, chili peppers and cayenne. Who’sThat Chick with the Peas? Oh it's Garbanzo!